Bambra is 30 minutes west of Geelong. Less than 2 hours drive south-west of Melbourne, Australia. 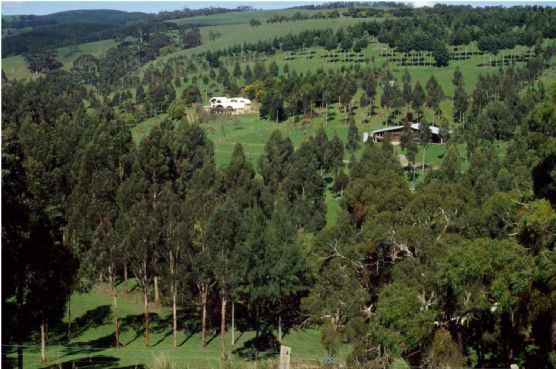 Bambra Agroforestry Farm in 1987 (above right) and in 2001 (left). As Aldo Leopold once wrote: growing trees is like "writing a history on the landscape". My family have been farming in Australia since the mid 1800's. 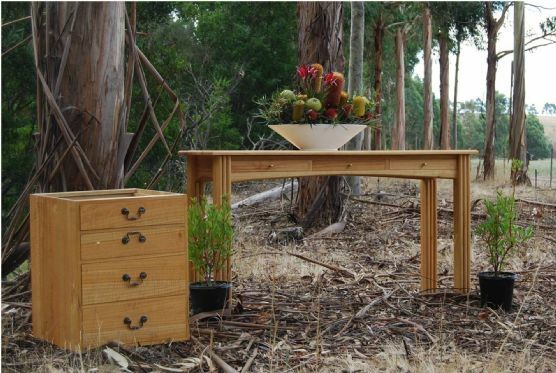 When I got my opportunity I wanted to see if I could make forestry attractive to the farming community. 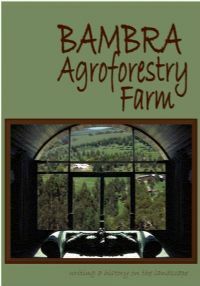 Bambra Agroforestry Farm is set up as an outdoor classroom for practical field days and workshops. More than 10,000 people have visited the farm since we began planting trees in 1987. 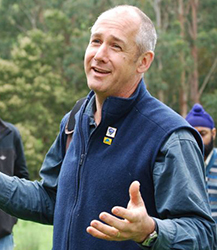 Our aim is not to 'demonstrate' how farmers should grow trees but to provide a place where they can explore the opportunities that agroforestry might provide them on their farm and practical knowledge on how they might achieve their own goals. The farm displays more than 50 commercial tree species, various planting arrangements and practical management options. Over the years we've run hundreds of tours, field days and workshops on the farm for farmer groups, government agencies, international tours, schools and more. We've even built a classroom in the old shearing shed with a kitchen other facilties. 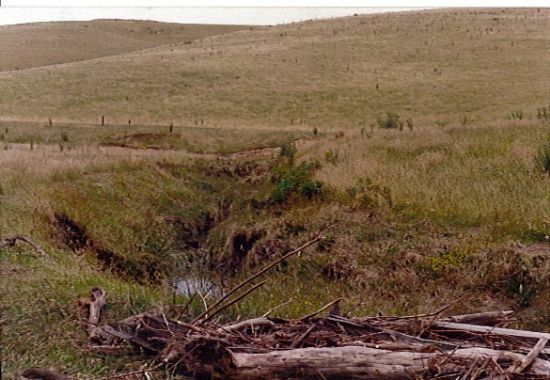 The 12-page full-colour guide takes you on a guided tour of the farm and provides technical information on a range of species and management options. Our first trial harvest of pruned eucalypts involved 10-year-old trees (30-40cm diameter). That only proved that backsawing of Shining Gum created drying problems. Our 16-year-old harvest (50cm) was more promising. It proved that growth stresses were not an issue in well managed straight trees and that quatersawing produced stable boards with lower risk of internal checking and highlighted fiddleback grain if present. But, the logs could have been bigger. Our most recent harvest was of 60-70cm diameter Veneer logs that were sent to China for processing. More detail . .